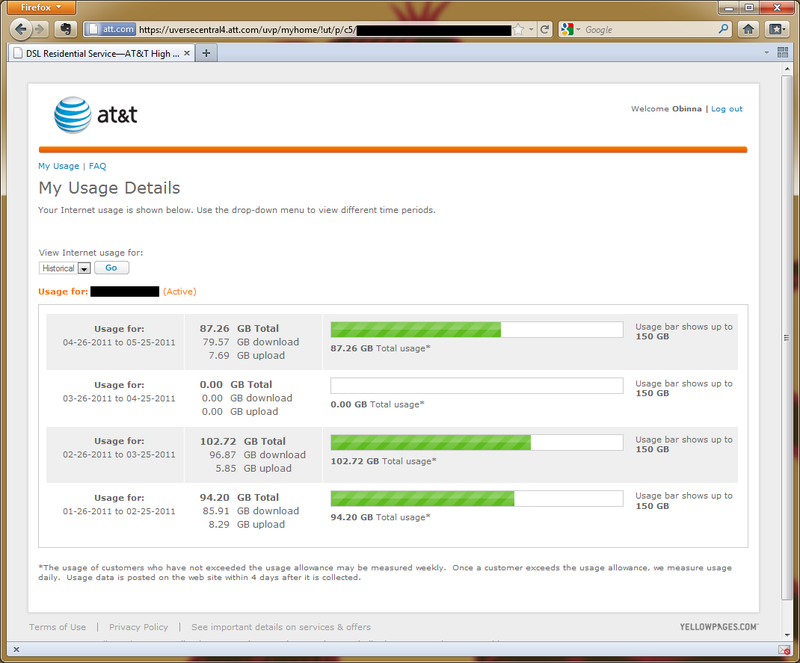 Shades of Black: AT&T broadband usage cap - should I be worried? AT&T broadband usage cap - should I be worried? It appears that the answer is no. For those unaware, AT&T recently instituted a cap on usage for its broadband internet customers - 150 GB per month for DSL (which I have) and 250 GB per month for UVerse (after which there is a $10 fee for each 50 GB over the cap). My initial reaction to this was of course outrage - especially since even their Elite DSL package (which I have, because UVerse is not available in my area) can be inconsistent at times. I would have been even more indignant if they did not provide a way to monitor your data usage. But, fortunately, they do - though I had to do some digging find this out. 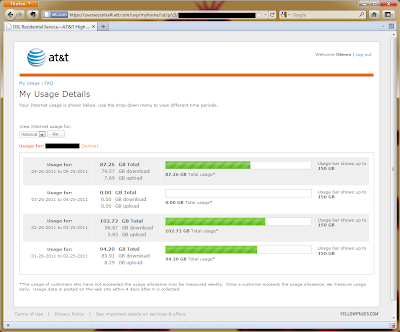 You just need to go to http://www.att.com/internet-usage, follow the link to "View my usage", then log in. When I followed these steps, I found the results below. They did not have any data for me for the current billing cycle, so I pulled up my historical usage data. Note that I'm missing data for my March-April billing cycle - I do not know the reason for this. So it seems that between two tech-savvy internet users (Chike and me), we top out around 100 GB per month. So we have about 50% room for growth before worrying about the cap (especially since I've begun streaming more Netflix and Hulu content as of late). This is obviously not an optimal situation, but I'll have to make do since Charter's required agreement periods and price jumps make them a non-starter for me (though their speeds are faster, and they have no cap that I'm aware of). It doesn't help either that AT&T has a history of questionable data accounting, at least in their wireless division. I guess you lucked out. Speaking of luck, I just received an invitation to Google Music (yea)...but that means that it will upload my (large) music collection to their servers, thus taking a massive chunk out of my data quota (boo).